(Eat to Live) or (Live to Eat): Egg pancake? 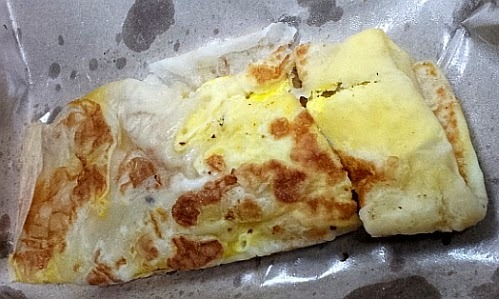 Roti telur or roti prata with egg - MYR2.20 - I sometimes eat it like how I eat bread - just roll it up like the photo above and eat it without any gravy or sauce so that I can eat it at my seat at work while still typing on the keyboard. Filling and with no mess. Oh yes, if I tapau back to the office, I would roll it up and eat it like that too.. But if I eat in, then would usually use the fork and spoon, ohh with fish curry+dhall, haha.. Sometimes eat in also I don't eat with any gravy or sauce so that I can fully savour the taste of flour and egg. Not a fan of it with egg as it makes it taste like omelette. Omelette has no taste of flour. I love the taste of flour (wheat) with egg. Some places here in Penang, you can actually request the mamak to infuse some gravy along with the egg before wrapping the dough up and toasting it, then your roti will taste more awesome! Actually, you even need to request them not to cut the roti up for you, they cut it before serving/packing by default.. I stopped them from cutting it halfway so in the photo you can see a section is cut. Oh they actually layan that request? I see they are usually very busy so did not make any special request. Roti canai with anything added to it tempts me all the time. It's tempting me again just looking at the pic. Me too. It has been a long time I did not eat this. This is a satisfying snack. What about other types of roti? Roti bawang, roti sardine, roti banana? You have not tried eating them on their own before?